Shield Azure, a Visigoth capital (chapiter, as in a column's top) Argent, in chief a mitre Or with its lappets Or and garnished Gules. Mural crown Argent with three visible towers (village rank) and white scroll reading in black upper case serifed letters "REAL - BRAGA". Real Commune was one of the pre-2013 communes of Braga Municipality; it had 7666 inhabitants in 2011 and covered 1.5 km². 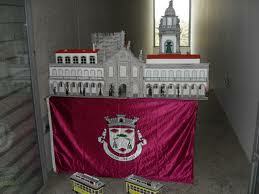 It is a typical Portuguese communal flag, with the coat of arms centred on a plain purple field. Shield Argent, a bishop's ecclesiastical hat Vert with twice six tassels set 1:2:3, on either side flanked by three closed books bound Purpure paged Or (!). Mural crown Argent with three visible towers (village rank) and white scroll reading in black upper case serifed letters "DUME - BRAGA". Dume Commune was one of the pre-2013 communes of Braga Municipality; it had 3251 inhabitants in 2011 and covered 3.9 km². It is a typical Portuguese communal flag, with the coat of arms centred on a plain red field. Shield Argent, a castle Gules masoned Or with port and windows Or, flanked by two maize ears Or leafed Vert, on base wavy Azure a barrulet wavy Argent. Mural crown Argent with three visible towers (village rank) and white scroll (Bénard Guedes style) reading in black upper case serifed letters "SEMELHE". Semelhe Commune was one of the pre-2013 communes of Braga Municipality; it had 783 inhabitants in 2011 and covered 3.0 km².